WWII – U.S. Marine Corps March/April 1944 through July 24, 1945: Private First Class (Pfc). 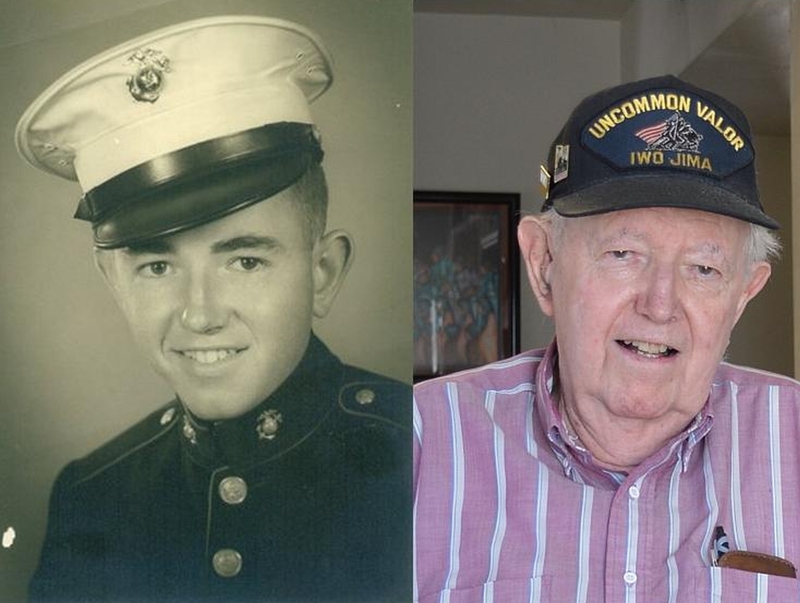 Jim served as a BAR (Browning Automatic Rifle) man with I Company of the 3rd Platoon (42 troops), 3rd Battalion, 28th Regiment of the 5th Marine Division (3/28). Jim and his unit went ashore in Iwo Jima on Februrary 19, 1945 (D-Day) at approximately 1210. 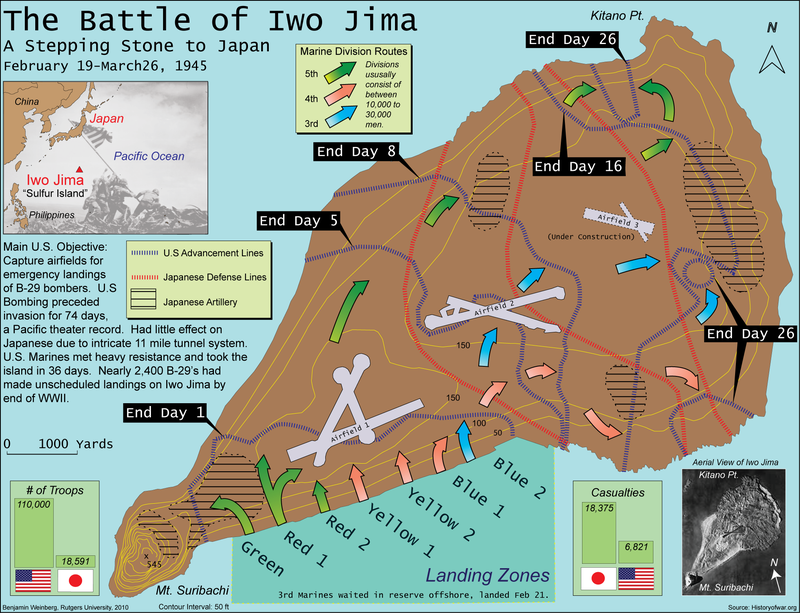 Jim was on Iwo Jima for 21 days before being injured on March 11th, 1945 (D+20) by Japanese grenades. 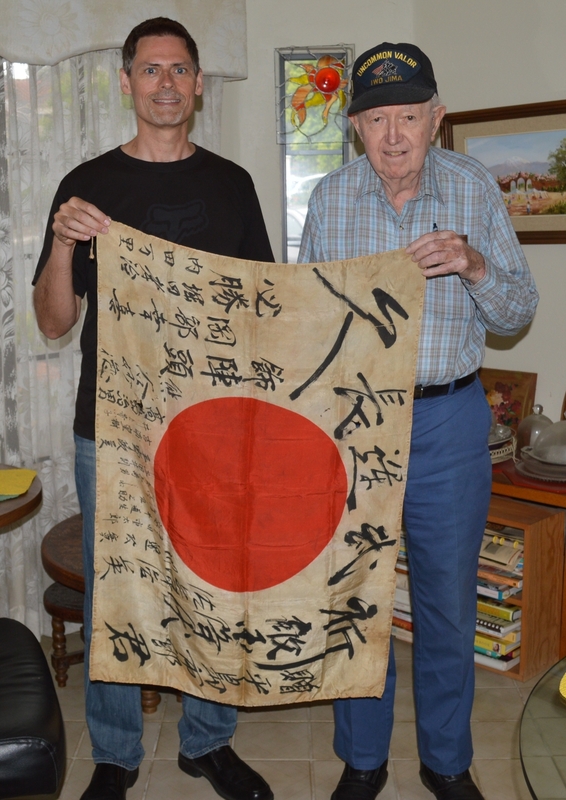 Photo: October 4, 2015 – Jim and I holding the Japanese “Good Luck Flag” he removed from a dead Japanese soldier on February 20, 1945 (D+1) in Iwo Jima. 1. “Praying for valor and eternal luck” (This seems to be a cheer to boost the spirits of the people on the battle field and pray for the safety of those who went to war). 2. “Defeat the enemy”. According to the translator, this should not be taken too literally. It has more to do with praying for the unity of the people, and striving to be better and more virtuous through following the path of righteousness. Defeating the enemy is a means to these more “noble” goals (Translator: “I think”). Note: All names are best guesses. 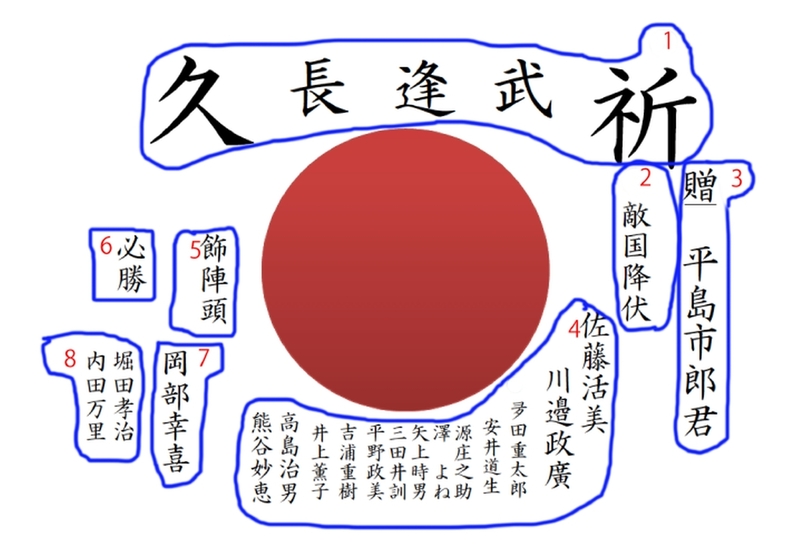 All names are presented in Japanese style with the family name first, followed by the given name. 4. This entire section is a list of names of people who signed the flag. The list goes from right to left. Jim (top left) at Tent Camp #1 in the Las Pulgas Valley, Camp Pendleton. In early October, 1944 Jim and his unit boarded an old Army troop transport in San Diego and shipped out to the Pacific. They suspected they were going to Hawaii and they were right. After “10 miserable days” they finally reached Hilo, Hawaii. Their new base was named Camp Tarawa. The camp was located on the Parker Ranch, near the tiny village of Kamuela. To the northeast was Mauna Loa rising to 13,000 feet, and to the southeast another range of mountains, covered with dense jungle. In early January, 1945, Jim was transported on the USS Lubbock (APA-197) from Camp Tarawa on the Big Island of Hawaii to Oahu. The ship was berthed directly under the famous Aloha Tower in Honolulu Harbor. Jim and his unit spent several days here and were given liberty on a rotation basis, so they were off the ship once every three days or so. However, there was not much to do or see in Honolulu. The town was small, and the sidewalks were overflowing with sailors, soldiers, and Marines. Nevertheless, no one passed up a chance to get off the ship. Upon returning from his second or third liberty, Jim found that during his absence, the military police had come on board and removed his BAR man. They had been informed that he was only 14 years old. This meant that Jim was promoted from assistant BAR man to BAR man. Jim told me that, for whatever reason, they didn’t find an assistant BAR man for him. Jim now not only had to operate the BAR but also carry all of the ammo that was normally handled by the assistant. After several days of practice landings on the island of Maui, to hopefully prepare them for the undisclosed landings on Iwo Jima, Jim and his unit returned to the USS Lubbock and set off for their next destination. After a week or so at sea, they dropped anchor in the harbor at Eniwetok Island which is part of the Marshall Islands. It was here that Jim and his unit first learned of the mission ahead. Large models of an island called Iwo Jima were brought out and they began regular studies of their upcoming missions. The models had been made from aerial photos and were in great detail, down to individual blockhouses and bunkers. As a private, Jim didn’t understand everything they showed them, but he was reassured when they said the Island was being bombed daily, and had been since before Christmas. They were told that their main objective was Mount Suribachi at the foot of the Island. From Eniwetok Island they headed for Saipan. From here, Jim could stand on the deck in the hours before dawn and hear aircraft taking off on bombing missions to Iwo Jima and Japan. During the day, he was able to watch them coming back, mainly landing on Tinian. 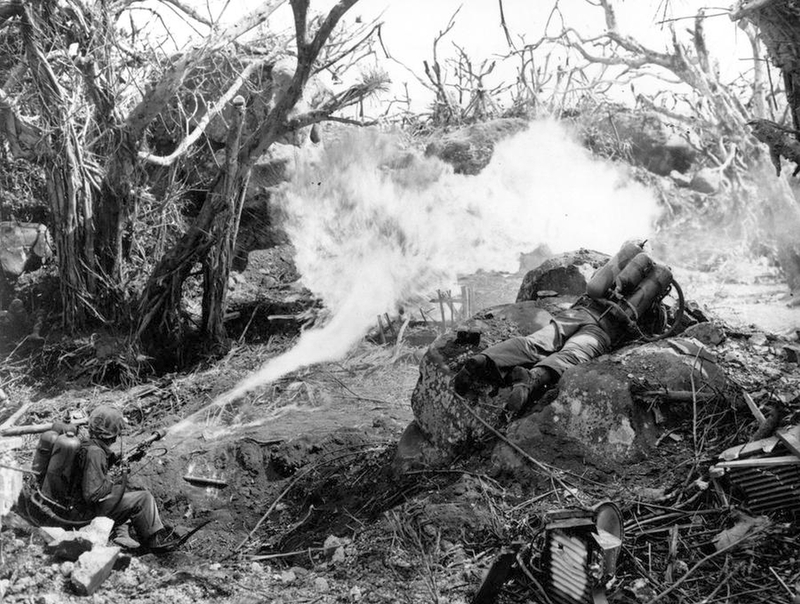 From Saipan, it was two more days of steaming to reach their objective – Iwo Jima. On February 18th, while still en route to Iwo Jima, Jim and his unit were issued ammunition, grenades, flares and other materials, and they spent the time loading their magazines and packs, etc. Their squad leader would check their gear at regular intervals and make sure everything was ship shape. They were told to remove all letters, and other documents and personal effects they would not be taking ashore and place them in containers. These would be returned to them when they got back to their next Camp. 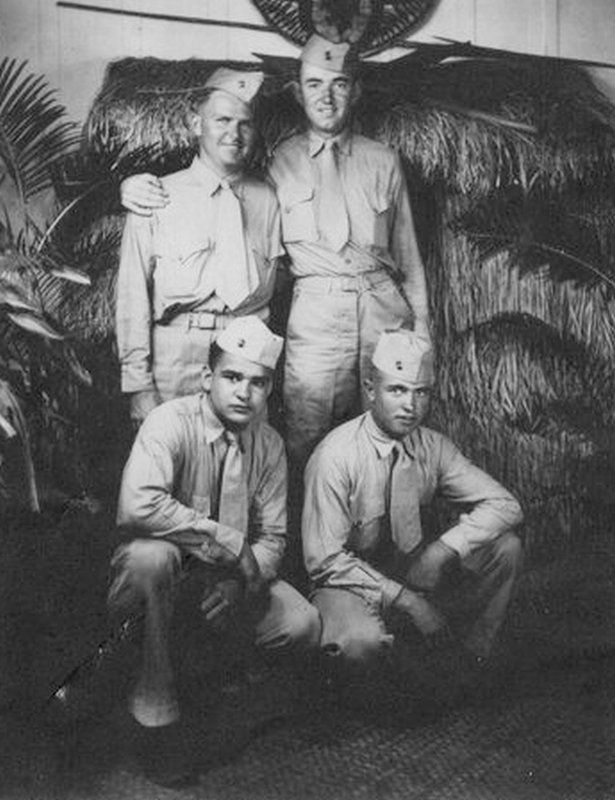 Jim (top right) while stationed in Honolulu, January , 1944. Neal C. Snell (top left): KIA on Iwo Jima. Pasqual Mercado (bottom left): WIA (shot in the mouth) on Iwo Jima, February 20, 1945 (D+1). Sim E. Ferguson (bottom right): WIA on Iwo Jima. Sim was Jim’s swimming rescuer during his training. USS Lubbock (APA-197): Off Iwo Jima beachhead, February 1945. On February 19, 1945 (D-Day), they were roused out of their bunks very early in the morning and fed a “magnificent meal”. On return to the troop compartment, they were organized into landing parties. As they waited, and waited, the tension mounted. They could hear the muffled sound of gun fire. Finally, the command was “saddle up” and they began to move up the ladder to the deck above. As Jim was now weighted down with not only his standard gear, but also the BAR ammunition normally carried by an assistant, the climb was very hard. As he came to the top of the ladder, he reached out and placed his hands around the hatch to pull himself up. Unfortunately, as his right hand was grasping the edge of the entrance to the head, its door was open, and when the door closed it was on his fingers. The squad leader saw what had happened and kicked the door open, but several fingers on Jim’s hand were badly crushed. Moving out onto the deck of the ship it was still dark, and while Jim’s fingers were throbbing, he soon forgot them as he watched shells and bombs exploding on the dark shadow of the island. Although probably not the Landing Craft, Vehicle, Personnel (LCVP) or Higgins boat that brought Jim to Green Beach in Iwo Jima, this is a photo on the shore of Iwo Jima in February, 1945 of one of the 18 LCVPs that were on board the USS Lubbock (APA-197). 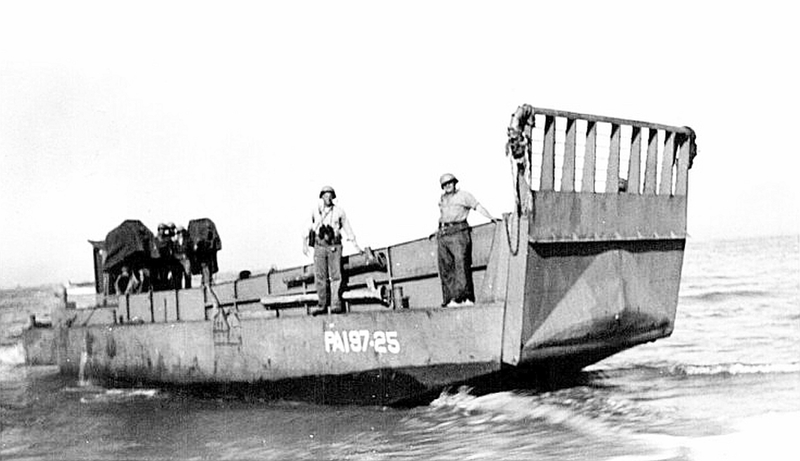 Jim and his unit formed up and moved to their assigned spot on the deck of the USS Lubbock (APA-197), and over the side they climbed, down the net to the landing craft below. Dawn was near, and Jim could see the landing craft sweeping up and down alongside the ship; much higher and lower than the practice sessions. The trick was to watch the boat come up, and time your release from the net to it so you landed in it as it reached its crest. Jim’s timing was fair, but it was still a jolt as he hit the boat’s deck, but a pleasant jolt to know he had made it. Several of the men made very hard landings, and all of them were trying to keep from having someone land on them. As the landing craft pulled away from the ship, it began to surge and wallow in the swells. The coxswain yelled to all the men to keep their heads down and to brace themselves to keep their footing. Jim thought they were about to land, but in fact they were maneuvering into position in a line of boats that was circling. They remained in this circling position for several hours. Several of the men became seasick; it was a mess. As the light grew stronger, and they became more familiar with their surroundings, they could see the looming shape of Mount Suribachi and watch the shells strike it. Because of the heavy casualties the 1/28 (1st Battalion, 28th Regiment) had sustained upon landing on Iwo Jima, Colonel Liversedge requested the release of 3/28 (3rd Battalion, 28th Regiment), the division reserve, to his control. General Rockey granted this request. The battalion, prepared to land on any 5th Division beach, received the order to land at 1210. Finally, the coxswain got the signal to start the run to the beach. Jim said that, by this time, they would have “fought a tiger” to get out of that boat. As they approached, Suribachi became a beacon on their left and Jim was struck dumb by the thought, “they expect me to get up that F— Mountain”. Ten minutes later the first boats of the 3rd battalion crossed the line of departure. As the leading wave approached the shore, heavy fire from Mount Suribachi and the high ground north of the landing beaches was directed at the boats. This unit suffered many more casualties during the ship-to-shore movement than had the 1st and 2nd Battalions. Shortly after 1300, all elements were ashore, though it was not until late afternoon that the battalion was able to edge its way into the line. Aerial view of circle patterns created by landing craft forming up offshore in Iwo Jima, 1945, waiting for the signal to head to the beach. Jim was in this type of formation for several hours. Footage of a medical evacuation on Green Beach at 1500 hours on February 19, 1945 (D-Day) using one of the USS Lubbock (APA-197)’s LCVPs. 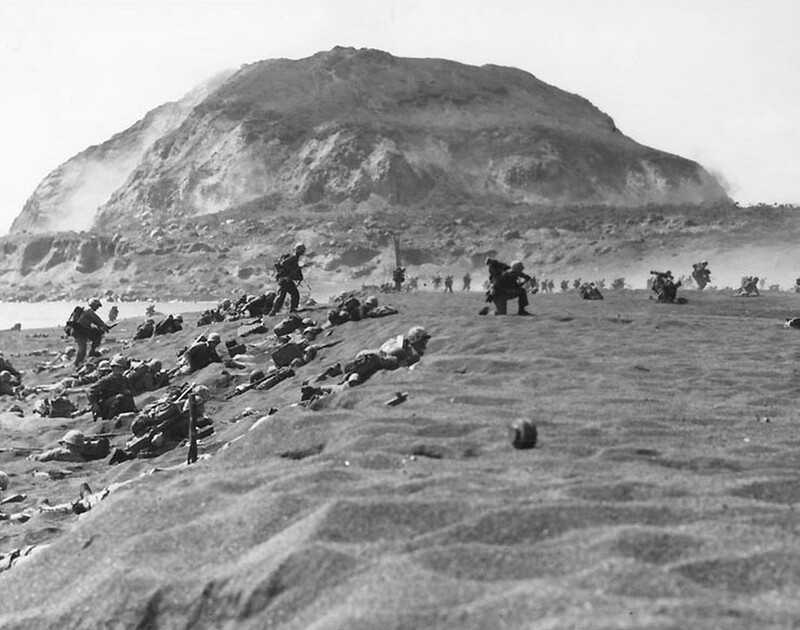 5th Division Marines moving inland off the beach, after coming ashore on Iwo Jima, 19 Feb 1945; note Mount Suribachi in background. Jim didn’t remember actually getting on shore, he just recalled that he had spent a couple of hours feeling sorry for himself as he nursed his bad fingers, but as soon as he was on the sand, he forgot how sore they were and began to dig. But digging really did no good. It wasn’t really sand, but black ash and it was so soft it provided no means to really dig. Here is where training pays off. The platoon sergeant got up and gave the signal to move and Jim just followed him. Never was Suribachi out of the corner of Jim’s eye, and the dread it caused him, but he moved forward and up the first terrace. As Jim moved forward, Don Rogers, a veteran of the South Pacific and a Para-Marine joined him and they became a team. He would move up, and Jim would follow. They did this all day. By nightfall they had reached the saddle of the Island and turned toward Suribachi. The order came to dig in, to get into a foxhole and prepare for a counter attack. Don and Jim found a shell hole, and shored it up and got in. Jim didn’t recall anything about that night except neither of them slept, and they could watch out over the sea to their right, where a ship would let off a salvo and they would see the flare of the guns, then three red streaks heading toward them. The shells would hit Suribachi or its base and the foxhole would shake. At dawn (D+1), Don got out and made the first run forward, and as on the prior day Jim followed. But on the second run, in mid flight, Don was hit. When Jim reached him he was down with a large gash at the back of his head (WIA). The Corpsman came up and told Jim to move out. As Jim moved forward, Cpl. Stoghbauer took him in tow, and they followed the old routine. They were taking heavy mortar fire; from where, they could not tell. Tanks were coming up to support them, but they were really exposed. In a Japanese gun emplacement which had been knocked out they came upon Robert Livingston, lying in it mortally wounded (KIA). Bob had been the closest thing to a big brother to Jim since joining the outfit at Camp Pendleton. He had been hit with probably a mortar fragment and, while still breathing, was in terrible condition. They pulled him out of the emplacement, and got him into a tank that was parked a few feet away. Stoghbauer lead Jim out and, as they pulled up at the first stop, a shell hole, a Japanese came into sight about 30 yards to Jim’s right. Jim aimed at him and pulled the trigger on the BAR, but nothing happened. He slid the bolt open, ejecting a round, and again pulled the trigger; nothing. Stoghbauer had not seen the Jap, and before Jim could do anything more he disappeared. This was the only living Japanese, other than prisoners and Jim’s last day on the island, that he saw in the three weeks he was on the Island. They were very close to the base of Suribachi, and the bombing, firing and shelling was intense. Several Marines were lying prone on a slope facing the mountain, and they joined them. The slope was material from a trench and the trench was full of dead Japs, piled like cordwood, and the bodies were torn to pieces by the shelling and bombing. 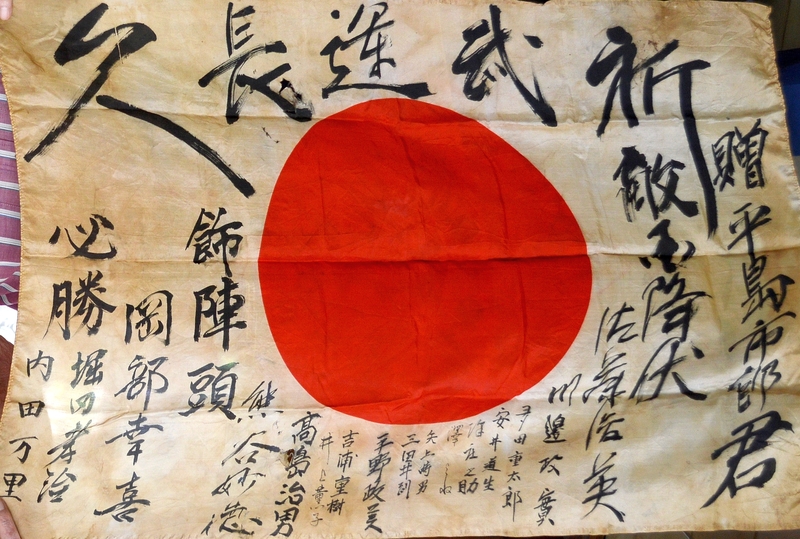 Wrapped around the head of one was a Jap flag, which Jim pulled off and stuffed into his jacket pocket. Jim felt that the Marines were grouped much too close together, as the man on his right was actually touching him. There was an enormous explosion, just to Jim’s right, which lifted him up and to his left several feet. Someone was pulling at him, and yelling, but he couldn’t hear a thing, just a terrible ringing in his ears. He was still holding on to his useless BAR as they dragged him back some distance to an aid station. He was covered with blood, but it turned out to be that of the man who had been on his right. Whatever hit him tore him apart and covered Jim with blood and flesh. It had also torn the pack off Jim’s back, ripping it to shreds. Jim’s only wound was a small one on the back of his neck and two punctured ear drums. Jim lay in the aid station until he regained some sense of where he was, and then he told them [corpsmen] he wasn’t wounded and was going to rejoin his unit. The Corpsman couldn’t believe it when Jim said he was OK, and he took a minute or two to check Jim out, then said go on back. When Jim got back, the line had moved and was only about 100 yards from the foot of Suribachi. Jim’s unit had moved well to the right, and as he rejoined it Sergeant George Lundberg placed him on the right flank of the platoon. They were spaced about three to five yards apart, in a line facing the mountain. Someone was directing bombing strikes on the area in their front, and the planes were coming in from our left, dropping the bombs, and strafing. The line was marked on the ground by a crimson colored panel. Unfortunately, the unit behind them didn’t realize where Jim’s unit was and laid out a panel behind them. Jim and his unit never saw the plane, but all of a sudden they were overwhelmed by machine gun fire, that went down their line from left to right. This was 50 caliber fire. It tore the leg off Cpl. Stan Slanga, who Jim later learned died of his wound aboard the hospital ship, but no one else was touched. Someone had the foresight to run back and pull the panel away, avoiding the planes that followed. The area was a mass of huge boulders that had come down from the mountain. The Japs had used these to their advantage to set up fields of fire on the trails leading through the area. Lundberg had Jim cover their two flame-throwers, Klatt and Volgeli as they fired into the openings to clear the area (see next photo and description). Stoghbauer and Jim dug in that night. Jim was not of any use as a guard as he could only hear someone if they yelled at him. Jim didn’t remember much of this night except that to their left the fighting kept up intensely all night. In the morning they learned that most of their machine gun platoon had been destroyed. As they moved forward they could see the bodies everywhere, and mounds of empty shells and ammo boxes. The third day, February 21 (D+2), was one of prying into the emplacements built into the rubble at the mountain’s base. By late afternoon they seemed to have it secured. As the light began to fade Ed Jones took Jim, Frank Prelec and Bill Mackoff and began a patrol up the mountain. They climbed perhaps 70 to 100 feet up, saw nothing, and as it began to rain and grew darker, they returned to the platoon. Ed told Jim to dig in while he reported to the platoon commander. On his return the rain was coming down hard. Ed got into the foxhole with Jim, and they sat together with the water rising. Jim had never done any drinking; as it got colder and wetter, Ed poked Jim and handed him a small bottle of medicinal brandy. It was a fire going down, then spreading out to warm Jim. What a wonderful, miserable night. In the morning, February 22 (D+3), it was mopping up. They cleared more bunkers, and reorganized their people. But the battle in the south was still on. As Jim and his unit were at ease, Cpl. James Cook was leaning on a large boulder, when Jim saw a puff of dust rise from James’ chest; he was dead before he hit the ground. That afternoon they were joined by a K-9 unit, and as they dug in for the night Jim was assigned to a foxhole with one of them [dog] because of his hearing. It was the first night on the Island that Jim slept. Frank Prelec was not so lucky. During the night a mortar round landed in his foxhole and he was killed. By the end of the day their area was considered secure, and they were pulled back several hundred yards and told to dig in and fortify their position. Five of them got together and, using shovels, they dug a large pit, covered it with boards and piled sand bags on top. The heat from the volcanic ash made the hole warm and almost cozy. With five in the hole they were able to get some sleep, with only one man on watch. Again, because of Jim’s lack of hearing, he was left to sleep. However, during the night the mortar rounds kept coming in. Jim was awakened by a huge explosion. The sky lit up like daylight, and the word “Gas” was sounded. None of them had kept their gas masks after landing, so there was a mad scramble before it became clear that what was being yelled was “Gas dump hit”. The fuel dump near their area was on fire. They all went back into their hole and to sleep. Their platoon [3rd] of 42 men was now down to about 25. 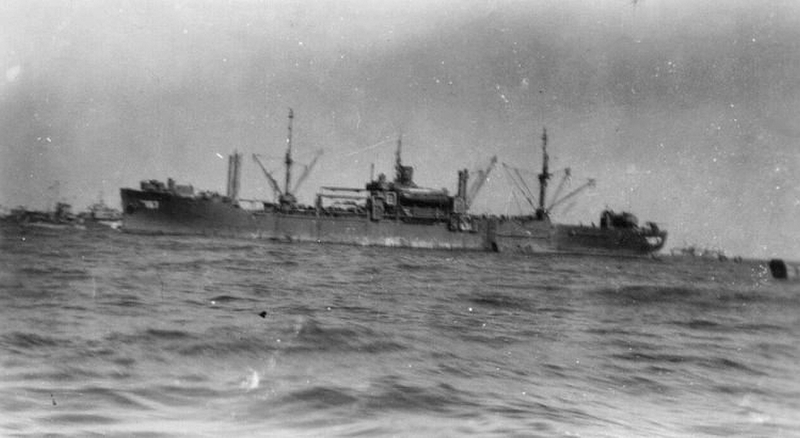 They remained in this area for another day, and they used the time to go down to the beach and trade souvenirs to the LST crews for 10-in-one rations. These were highly prized as they contained crackers, jam, and other foods much superior to the K-1 rations they had subsisted on to that time. The beach area was a shocking mess. The waves were rolling a tide of wrecked equipment back and forth. Jeeps, DUKWs and even tanks. The beach was still under fire, from both the south and north, but no one seemed to pay much attention to it. Wounded were laid out in revetments and were loaded onto the LSTs as fast as possible. Nevertheless, it was possible to see some order coming on; matting was down, permitting wheeled vehicles to gain footing and move up the steep terraces. As Jim looked back toward their area he was struck by just how steep these were. He thought,”How were we able to get up and over this obstacle”? With Suribachi secured their Division was assigned to take the left flank of the advance to the north. As a private Jim knew nothing but what he was told, and that was to “Saddle up and move out”. They marched north for about a mile or so, past the first airfield and just beyond they went into a skirmish line, and they were warned to be alert for mines. Jim had no idea what to look for; mines had been discussed in training, but they had never taken them seriously, and they were all at a loss. In a skirmish line you can’t step in the footsteps of anyone because they are not in front of you but at your left and right. It was grit your teeth and move forward. Within a few hundred yards they entered ground that began to rise, and was broken into small canyons and ridges. It was impossible to keep contact with the man on your right, but the word kept coming down the line, “Keep contact to the right”! They passed through a unit of Marines, and relieved them. In their front, and slightly to the right was a hill, which they were told was “362”, and their objective was to drive the Japs out of the caves they had tunneled into it. To do this meant moving forward to the entrances, bringing up flame throwers, and satchel charges (explosives on long poles or in bags) and burning or blowing them up. It was a terrible form of combat; to get at one entrance you were almost always exposed to fire from the Hill 362, or from caves on the face of the canyons. They lost several men each day, and they gained very little ground. They lost track of time, and kept wondering, when do we get relieved? Relief finally came and they were pulled back about a mile. Replacements began to arrive, men who had been on the beach for a week or more as working parties, now told to join them as infantrymen. Nothing else in the world is as bad as being a replacement in an infantry platoon in combat. You are among strangers; you know that if push comes to shove the old-timers will hang together, and you are on your own. You don’t know who is good at the job and who is bad. Of course this runs both ways. Jim believes they received 10 or 12 men, and as a unit they were far from what they had been. With their platoon reinforced they again moved north. Hill 362 was behind them, but another Hill 362 was again on their front. This was designated 362B, and they started all over again. In fact their unit did not have to confront 362B head on; they were to its left and were able to swing around it, but they were under fire from it, the caves on its flank, and from the broken ground running to their left down to the sea. To stay alive you kept yourself in a foxhole or other depression and only emerged to fire into designated caves, pointed out by the remaining NCOs. You made sure not to group up, as this always drew fire. They kept at this for several days, and then passed beyond 362B. At this point they could see the ocean to the north as well as to the west. The ground began to slope down; they were fighting from the high ground. Unfortunately, the going did not improve. They entered the worst terrain they had yet seen for coordinated tactics. Imagine the Grand Canyon in miniature. The floor of the canyon is 10 to 15 feet from the mesa top. But its not one river bottom, it’s hundreds of tiny branches, none of which you can see into more than 10 to 15 feet. And each butte honeycombed with caves and interconnected with tunnels. You can’t get on the mesa top, because it provides no cover, and does not permit you to move. You have to remain in the canyons, and take fire from all directions. They entered this area on D+18. Their first day they gained perhaps 20 or 30 yards. Jim recalls they found what must have been a bathing area which the Japs had carved out of one of the butte walls. It had individual tubs carved into the soft volcanic rock, and even a place where they must have heated the water. Japanese gear was all over the place but no bodies. They were taking the dead with them as the Marines pushed them back. Jim’s unit was losing men at a terrible rate, four or five a day; but most of them were replacements. On March 10, 1945 (D+19) they repeated the same tactic as the day before, but gained almost no ground. That day they lost Sergeant Robert Whitehead, the sole remaining NCO from their original platoon. Jim was with him in the bottom of a canyon when he was shot in the chest. Jim believes there were only two others left from their original 42, including him. At the end, they lost seven killed and all but two of the rest wounded. The platoon was now in the hands of a replacement NCO. The Company commander was also a replacement and word came down that they were to dig in for the night. As they were digging in they were told that they were to change tactic and move out before daybreak, so they could see the flash of the Jap fire, to provide them some way to find the Japanese before getting hit. jim spent a sleepless night in a foxhole with a new replacement. On March 11, 1945 (D+20; 21 Days on Iwo Jima), by the dim light of the stars, they left their foxholes. It was really scary, as they had been drilled never to venture out of their holes at night. But the change seemed to work, as they appeared to catch the Japs asleep. Jim moved foreword about 50 yards, and came to a road. He kept going, but lost contact with his foxhole mate of the night. The road turned right into a small clearing, about the size of a basketball court. Jim continued to move down the road for a short distance when all of a sudden muzzle flashes erupted from the face of the far canyon wall that he could just make out against the skyline on his right about 100 feet away. He turned and began to return fire at the flashes, when several arcs of sparks came toward him. These were Japanese grenades, and one upended him and knocked him down. Jim felt the impact of the grenade on his legs. He lost track of his BAR, and he just kind of lost track of things in general. Jim could see the continued flash of fire from the original spot, but it was not directed at him so far as he could tell. As Jim lay there, he began to hear a voice speaking Japanese. Light was just beginning to provide some ability to see. Jim rolled onto his belly, and, just as he did, the ground in front of his face, maybe a foot or 2 away, lifted up, and a helmet and face appeared. This was only about the second or third live Japanese soldier Jim had seen in the prior 20 days, and Jim only got a brief look before the Jap disappeared. Jim knew what was coming as he heard the “clunk”, “clunk” of a Japanese grenade being armed. The next thing he saw was a stream of sparks come out of the hole and roll up to his right side. Jim scooped the grenade right back into the hole then jumped up and took off back up the road. Jim only ran about 50 or 60 feet when he collapsed from loss of blood. He was in the middle of the road, with no cover. As he lay there in a sort of trance, a Marine came down the road toward him, to try and rescue him. They [the Japanese] shot him. Jim doesn’t recall how long he lay in the road, when PFC. J.J.Martin began to direct a half-track down the road toward Jim and several other fallen Marines. It seemed to take forever, but the half-track finally moved over Jim’s would be rescuer, stopped, pulled him in, then did the same for Jim. With both of them aboard, it backed up to the top of the road where they pulled the two of them out and loaded them onto a jeep which took them back to the airstrip for evacuation. Jim informed me that on February 20th, 1945 (D+1) he was above and behind the two men is this photo, somewhat to the right, and maybe 20 or 30 yards back. Jim had his BAR trained and shooting on the opening of the cave where the two flamethrowers converged. Jim said that whoever took the photo must have been very close to him, but he didn’t see him. Pvt. Richard A. Klatt (left / Company I, Headquarters Platoon): KIA several days later. Pfc. Wilfred M. Voegeli (right / 1st Platoon): Awarded a Bronze Star for his actions on Iwo Jima. Note: Many years after the war, Jim was the corresponding secretary of the I Company Newsletter. There were still many of the men alive and he often got phone calls or letters that provided information. John Overmyer, Pharmacist’s Mate (PhM) from the 2nd Platoon (since deceased), said he encountered Klatt just after his flamethrower had been struck and burst into flames. John went into some detail, saying Klatt was horribly burned, and John was unable to do anything, even unable to pour water on his burns as he had used up all of his supply. This appears to be the footage of the same event from which the previous photo was taken. Jim (right) and TC Coley at the 52nd anniversary of the Battle of Iwo Jima at Camp Pendleton in 1997. 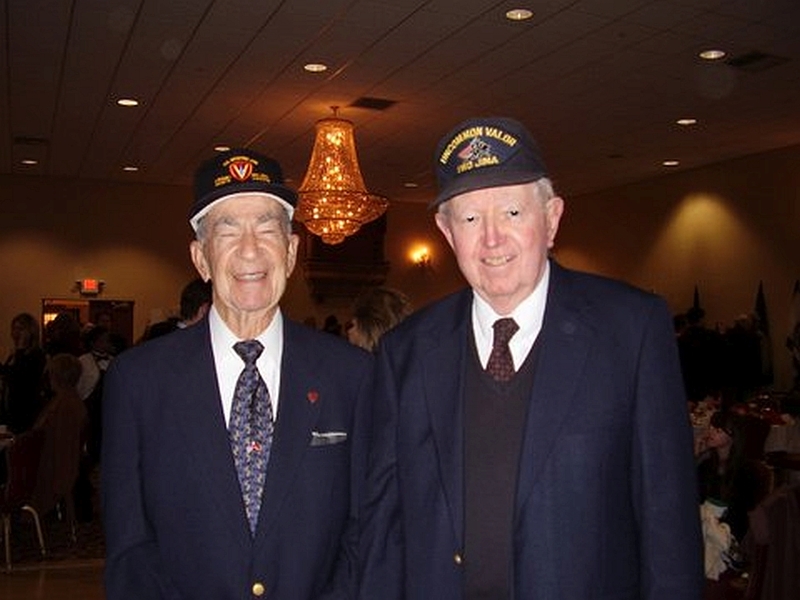 Jim and TC met at this reunion and started comparing notes of their experiences on Iwo Jima. When Jim mentioned being rescued by an M3 half-track, TC’s eyes lit up, and he informed Jim that he could have very well been the driver of the half-track as his unit was involved in these rescues. Jim speaking at the Pacific Views Event Center, Camp Pendleton on May 22, 2015 during an event hosted by Iwo Jima Monument West to raise awareness for Iwo Jima veterans – http://www.pendleton.marines.mil/PendletonNews/NewsArticleDisplay/tabid/5440/Article/589611/camp-pendleton-raises-awareness-for-iwo-jima-veterans.aspx. 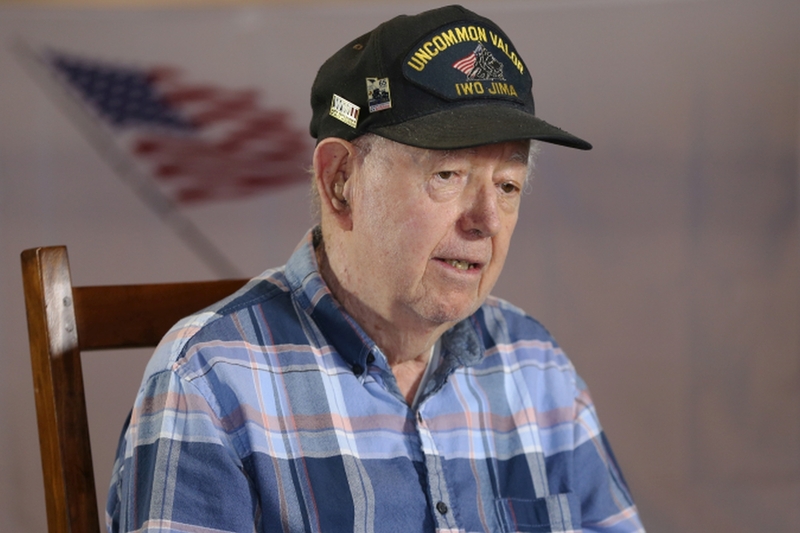 Nine veterans of the Battle of Iwo Jima were in attendance to recount their tales of the historic amphibious landing, the raising of the flag atop Mount Suribachi and the days that followed. 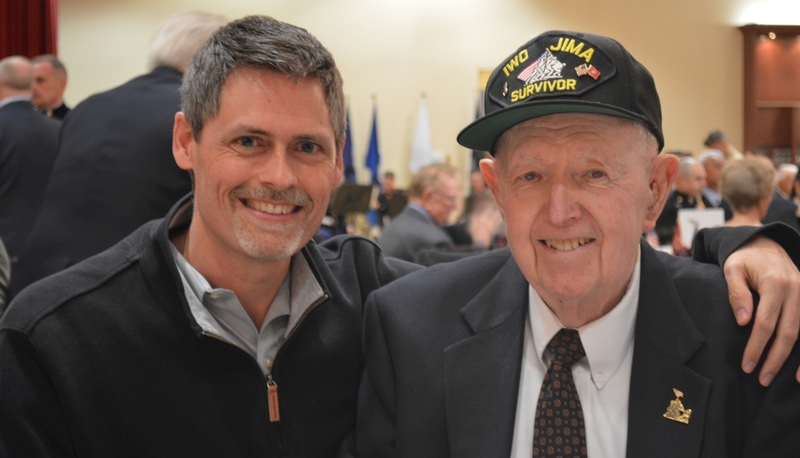 Jim Shriver and Brent Spencer at the 73rd Iwo Jima Memorial Banquet. Jim was born August 23, 1926 in Escondido, California.